The Racist-In-Chief continues to spout his pitiless rhetoric on immigration – aka don’t want no more brown-skinned people in my wannabe chaste white kingdom – even appropriating the memory of firebrand and Texas Rep. Barbara Jordan for his own uses by claiming his “America First” drivel echoes “the spirit” of Jordan on immigration. (Hint: It doesn’t.) 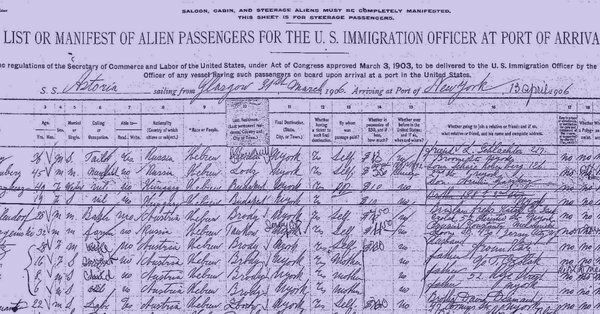 Amidst such racist hogwash – see right-wing social media like #Chain Migration and #BuildTheWall – take solace in the uppity brilliance of Resistance Genealogy, created by journalist, genealogy buff and descendant of Jewish immigrants Jennifer Mendelsohn. Tired of racist pundits and politicians slamming immigrants, and as a “hyphenated American” aware that “unless you came on the Mayflower, you’re Native American, or your ancestors came in slave ships, you are an immigrant,” she began researching the family trees of those public figures. In response to White House Social Media Director Dan Scavino’s call to end “chain migration,” the longstanding practice of family reunification: “So Dan, let’s say Victor Scavino arrives from Canelli, Italy in 1904, then brother Hector in 1905, brother Gildo in 1912, sister Esther in 1913, & sister Clotilde and their father Giuseppe in 1916, and they live together in NY. Do you think that would count as chain migration?” When Iowa’s wingnut Rep. Steve King – “We can’t restore our civilization with someone else’s babies” – badmouthed immigrants one too many times, Mendelsohn uncovered the arrival in this country of King’s ancestors in 1894. They were his grandmother Freda, age 4, with her two-year-old brother and infant sister – babies, all. Grateful for the people doing this research. This entry was posted on January 19, 2018 by Vox Populi in Opinion Leaders, Social Justice and tagged Abby Zimet, Dan Scavino, Ellis Island, immigration, Jennifer Mendelsohn, On Genealogical Glass Houses, racism, Stephen Miller, Tomi Lahren, Trump immigration ban.